For Turtles, Earth's Magnetism Is A Built-In GPS Loggerhead turtles are born with an ability to know where they are on Earth, and which way to swim to get to favorable feeding grounds, a new study finds. It turns out an extreme sensitivity to the planet's magnetic field lets them determine both longitude and latitude as they migrate. Loggerhead turtles are born with an ability to know where they are on Earth, and which way to swim to get to favorable feeding grounds. That's the conclusion from a new study by scientists at the University of North Carolina at Chapel Hill. The turtles appear to accomplish this by being exquisitely sensitive to the Earth's magnetic field. Humans using a compass can also tell which ways is north, "but a compass doesn't really tell you where you are," says UNC graduate student Nathan Putman. Paper maps are not standard issue for newborn turtles, but for them, that's not a problem. "Turtles can use the magnetic field as a sort of map. It gives them positional information," he says. Here's how it works. There are two components of a magnetic field. One is the intensity, or the strength of the field — the stronger the field, the closer to one of the poles. The other is inclination, or the angle the magnetic field lines intersect the Earth. A turtle can detect both components, and using them together, "it can get a good idea as to which side of the ocean it's on, not just whether it's in the northern or the southern part of it." Turtles can use the magnetic field as a sort of map. It gives them positional information. To prove this, Putman and his colleagues collected hatchling loggerhead turtles. "We take an individual turtle and place it in a circular, water-filled arena," he says. Around the arena are coils that can create a magnetic field, just like the one at any point on the globe. "So we just change the magnetic field around the turtle to magnetic fields that exist along their migratory route," Putman says. For the study, which they report in the latest issue of Current Biology, Putman created two environments, one in Puerto Rico and the other near Cape Verde Islands off the coast of Africa. "The Cape Verde turtles, which are on the eastern side of the Atlantic, swam southwest. 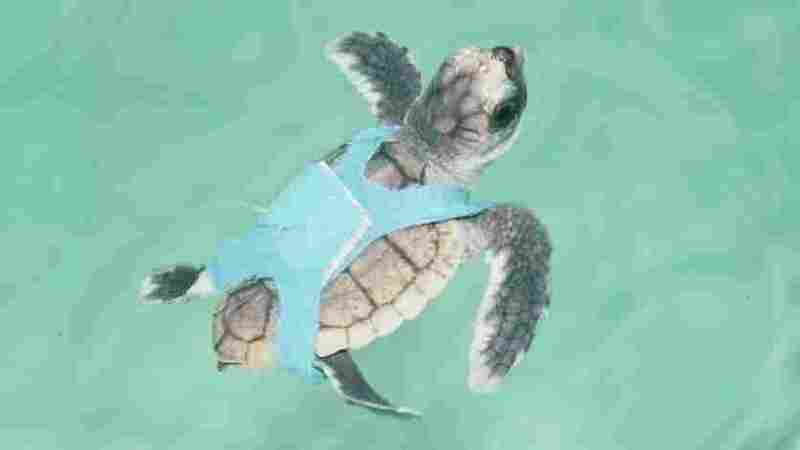 Near Puerto Rico, the turtles swam northeast," he says. There's a reason they swam in different directions. "What they're trying to do is get into the North Atlantic Gyre, that big circle of water that encloses the Sargasso Sea," says James Gould, a professor of ecology and evolutionary biology at Princeton University. You have to swim in different directions to get to the gyre, depending on whether you start out in Puerto Rico or Cape Verde. Being able to head in the right direction is a critical skill for hatchling turtles. The North Atlantic Gyre takes them to a place filled with a kind of seaweed called sargassum where they can hide out until they're big enough to avoid predators. Missing the gyre spells trouble. "You do that, you lose the sargassum, you lose the places you eat, you wind up in cold water and you die, basically," Gould says. The stunning thing is that these turtles are born knowing the right way to go. Exactly how they detect magnetic fields is still a bit of a mystery. Nathan Putman says scientists have known for a while that animals can detect latitude, a measure of how close they are to one of Earth's poles. His new study shows they can detect longitude — where in the east-west direction they are. And turtles aren't the only marine creatures that make long east-west journeys — elephant seals do it, as do sharks and tuna. "It seems like those migrations would be really difficult to accomplish if you can't determine your longitudinal position," Putman says. And he suspects that other animals besides turtles are using magnetic fields to tell them where they are. But humans probably aren't one of them — hence the popularity of GPS systems.